We believe that it's important to not only practice the external work of transformational change, but to practice the inner work of transformation: contemplative practice. The contemplative gives us the internal tools and practices to interrupt oppression inside ourselves so we can be a sustainable transformational change maker externally. It helps us see ourselves more clearly and helps us better understand our motivations and habituations. The contemplative is critical to any process of adaptive change, and that includes changing ourselves, becoming the people who can actually live in the world we wish to create! Read an article about contemplative activism by Holly Roach Knight, one of the leaders at Transform. She is currently a graduate student working to get two MA degrees, one in contemplative education at Naropa University and one in social justice community organizing at Prescott College. At Transform Network a lot of us have been engaged in learning contemplative practices and theology. We are also studying the field of contemplative education and are developing programs, workshops and curriculum in contemplative activism. 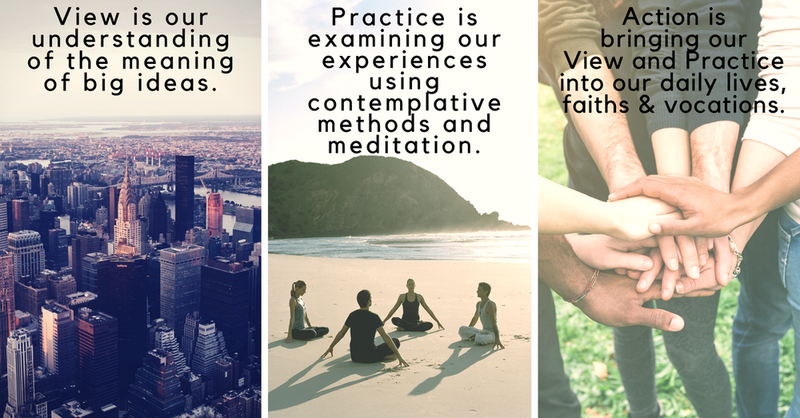 Our Contemplative Pedagogy pictured to the right is based on three steps as developed by Richard Brown at Naropa University.